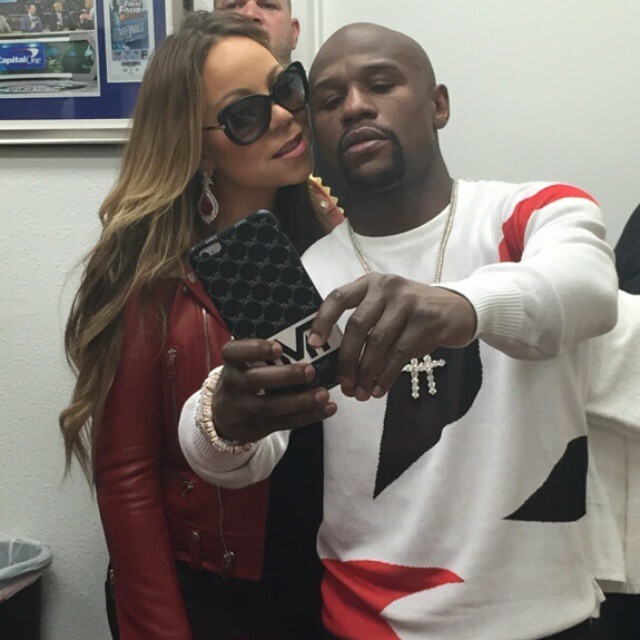 Mariah Carey had a selfie taken last week. No surprises there. It’s every self-respecting celebrity’s stock in trade. But this one was with a serial abuser of women. Which seems an odd choice for someone who has lived the hell of an abusive relationship. Except, Floyd Mayweather is the world’s highest paid athlete. And in his home town of Vegas this weekend, he’s one half of the biggest fight ever, an event so large it could plug the hole in the federal budget. Coincidentally, Mariah’s about to kick off a three-month trill at Caesars Palace. And she’s just launched the first single from her new album. And while she’s no slouch in drumming up her own publicity (see her turning up to a Vegas welcome event in Exhibit A below), well, it can’t hurt to hitch your wagon to the biggest circus in town, can it? So she dropped in all impromptu on Floyd’s training session, coiffed and powdered and blinged to the eyeballs and poured into a little black dress, with a bit of red leather to grunge it all up. Floyd took a picture. She posted it on Facebook, proudly declaring #TeamFloyd. You scratch my back, I’ll scratch yours. Mariah’s not alone though. Floyd’s surrounded by celebrity fans. Jamie Foxx. 50 Cent. Justin Timberlake. Christina Aguilera. Snoop Dogg. Lil Wayne. And then there’s Justin Bieber. That’s quite the bromance. Biebs will have the honour of carrying Floyd’s championship belts into the ring on Saturday. Bless. Floyd and Biebs have also taken Michael Jackson’s son Prince under their wing, a relationship which apparently extends to giving him advice on women. For the record, here’s how Floyd treats women. Five convictions over the past 14 years, the final one of which finally got him thrown in jail, though the judge delayed the sentence so Floyd could take part in a fight. He has punched his partners in the face, in the back of the head and in front of his kids. He has threatened his kids. One former partner says he pointed a gun at her foot and asked her which toe he should take off. If you have a spare 10 minutes, it’s all laid our here by Outside the Lines. Yet, Floyd somehow manages to get away with denying it all. “Still, no pictures, no nothing,” he says. This weekend marks Floyd’s biggest payday yet. Win, lose or draw, he walks away an estimated $200 million richer because, for all his wrongdoings, people are still prepared to pay to see him fight. So, to Floyd’s carefully cultivated celebrity bandwagon and the fans who think it’s no big deal to tune in, can I make this request: Don’t indulge this monster. Because anyone who shows up at the MGM Grand this weekend or forks out the $100 to watch it on TV is lining the pockets of an abuser. And, by inference, condoning his behaviour. Next Post I’m an English cricketer. Get me out of here! I love the way you write, Kaz. Sadly, and I hate to generalise, but I doubt that the followers of this monster would spare the time to read a thoughtful, honest article like this. Oh, and the Biebs – why am i not surprised? Birds of a feather. Good for you Kaz – take no prisoners! How has this thug become a role model? It’s an absolute mystery to me! Right on Kaz. It’s tempting to say I’d like to see the living daylights belted out of him…..but a) I think it’s unlikely and 2) watching people punch each other is just not a ‘sport’ to me. Mayweather is possibly the worst serial offender there is! I hope karma eventually bites him in the arse. Couldn’t agree more, Kel. I’d also like to see him taken for everything he’s got. Money seems to be the only thing that matters to him.